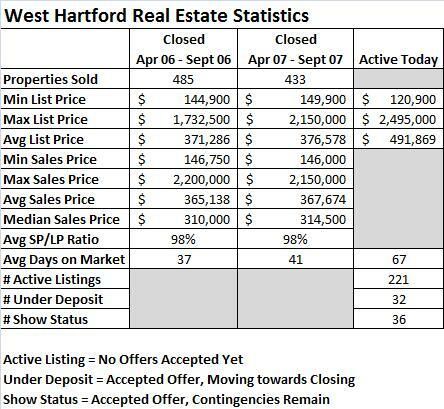 I’ve decided to break down the West Hartford statistics by elementary school district. There are 11 schools, so I’ll try to post a couple a day. We’re going in alphabetical order, starting with Aiken. Keep in mind that these are stats for single family residential houses only, listed in the Multiple Listing Service. No private sale data is included. 1. All of the data will come from the CT Multiple Listing Service, so private sale data will not be included in my analysis. 2. I’m comparing data from April through September in 2006 to data from April through September in 2007. These months are typically the most active in our local markets. 1. 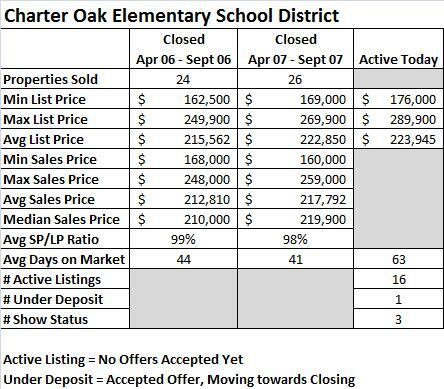 Prices are up 1% for the second and third quarters when comparing 2006 to 2007. 2. Average days on market are up slightly, but nothing drastic. Note: The chart has been updated with the Median Sales Price and Average Days on Market info requested in the comments. I will include this going forward on all other data posts.